We stayed in a one bedroom, one bathroom villa at this resort for a week in 2010. We had never been to Palm Springs before but had heard good things about the shopping. We booked this place without knowing anything about it, just hoping it would be okay, and we were very happy with what we saw when we arrived. 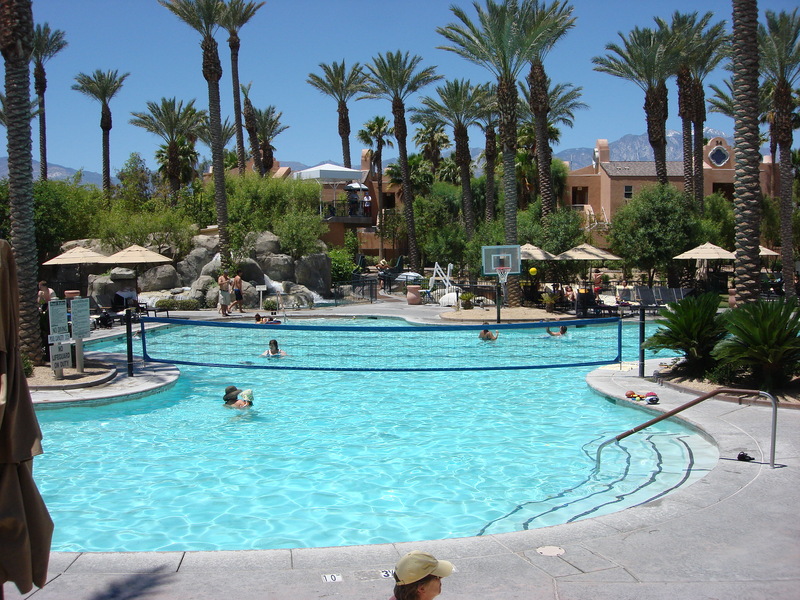 If you are looking for wheelchair accessible accommodations in Palm Springs, there are probably lots of nice places to choose from. 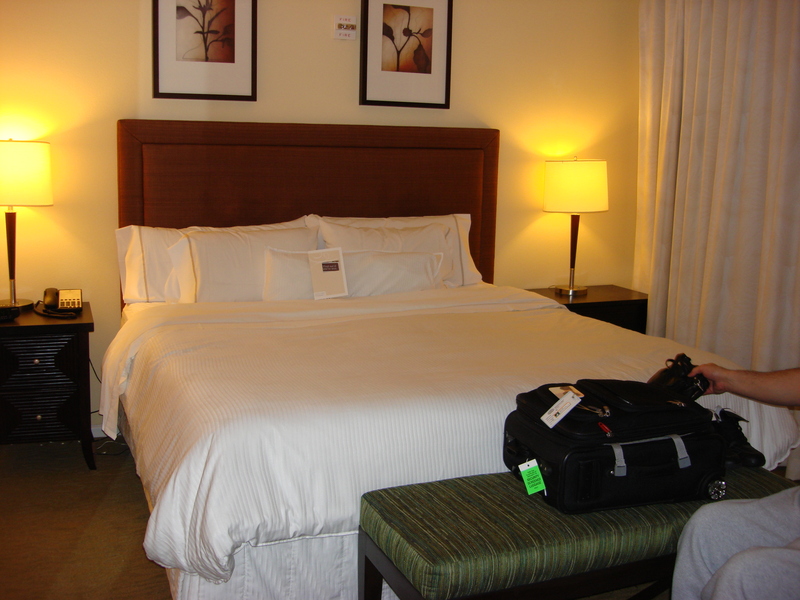 We chose the Westin and found it really exceeded our expectations. The unit we stayed in was unit 3819, a non-smoking unit on the main floor. There was parking for our rental car right outside of our unit. We entered the unit into the kitchen but there was a stackable washer and dryer just inside the doorway off to the side (super convenient!). 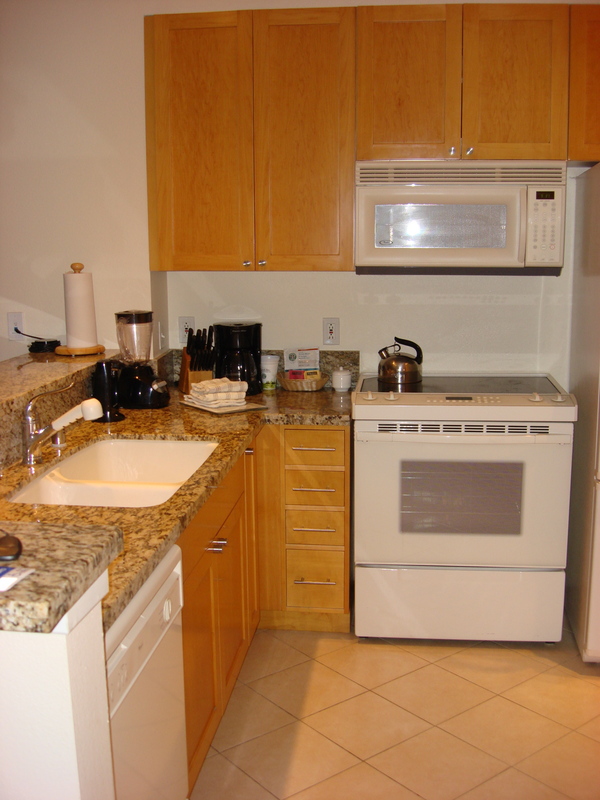 The kitchen was accessible, complete with a wheel-under sink, and had a fridge, dishwasher, stove and microwave. 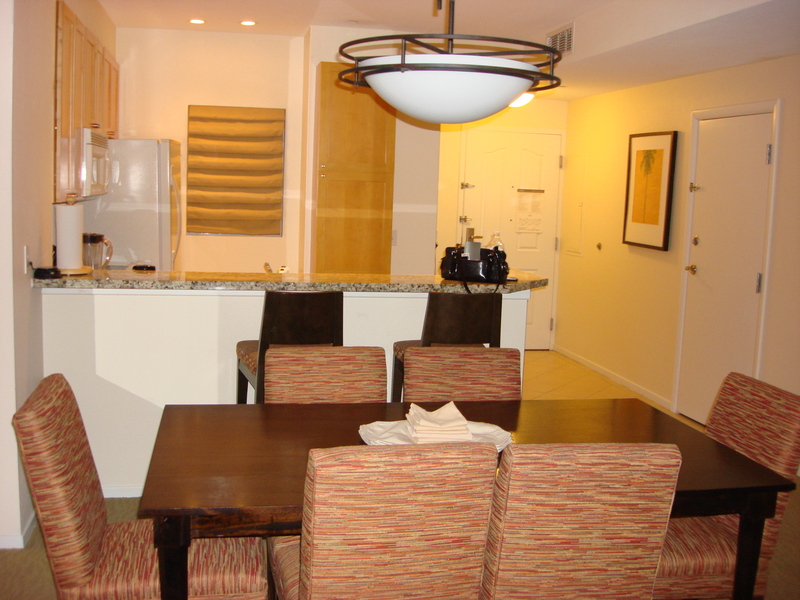 The kitchen led into the dining room area, where there was a table that seated six people. It wasn’t a huge space, but it was big enough that a wheelchair could get around the table and the table was high enough that a wheelchair could get underneath. 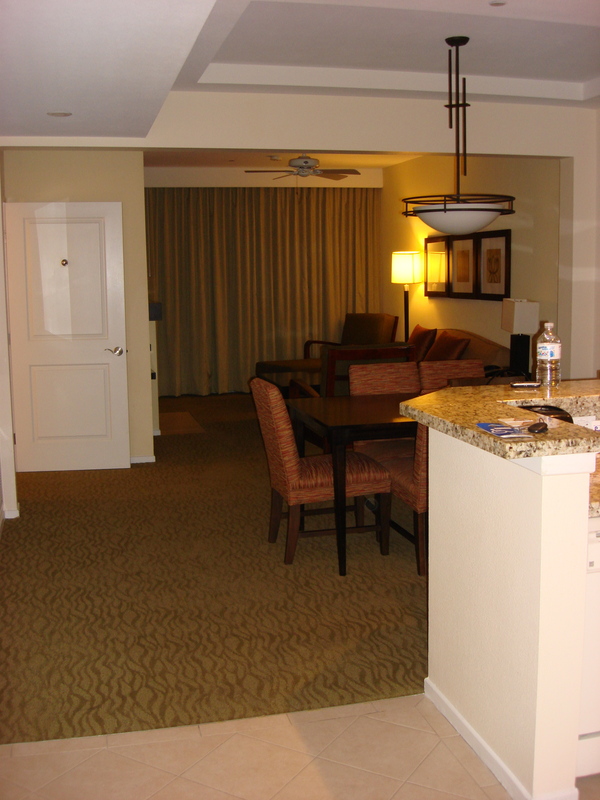 The living room area was beside the dining room. It had lots of seating, a TV and a fireplace. The couch in the living room was a pull-out sofa, so this room could sleep four if two people wanted to use the sofa bed. The living room patio doors opened out onto the private deck area. There was a patio table with chairs and a barbecue outside on the deck. The bedroom also had patio doors that opened out onto the deck. Both sets of doors in the below picture were connected to our unit. The bedroom was comfortable and a good size. 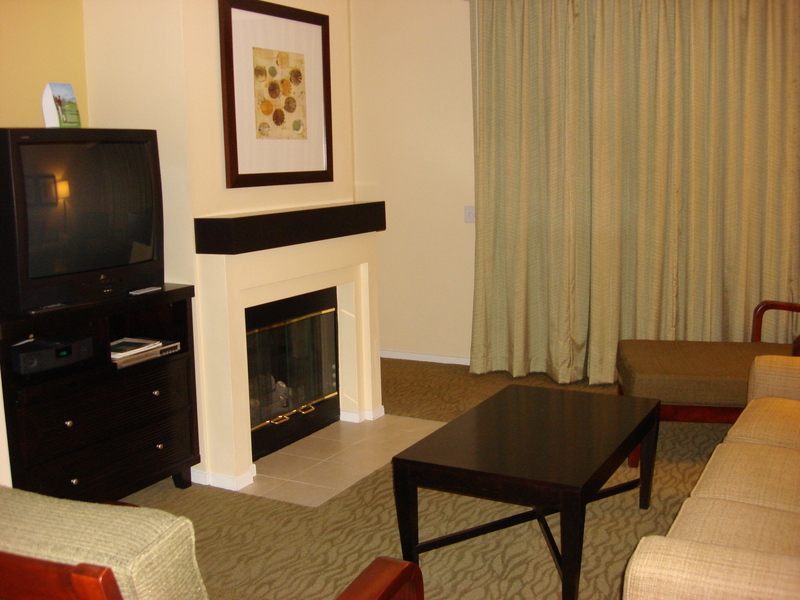 There was a king-sized bed, a TV and a fireplace in the bedroom. 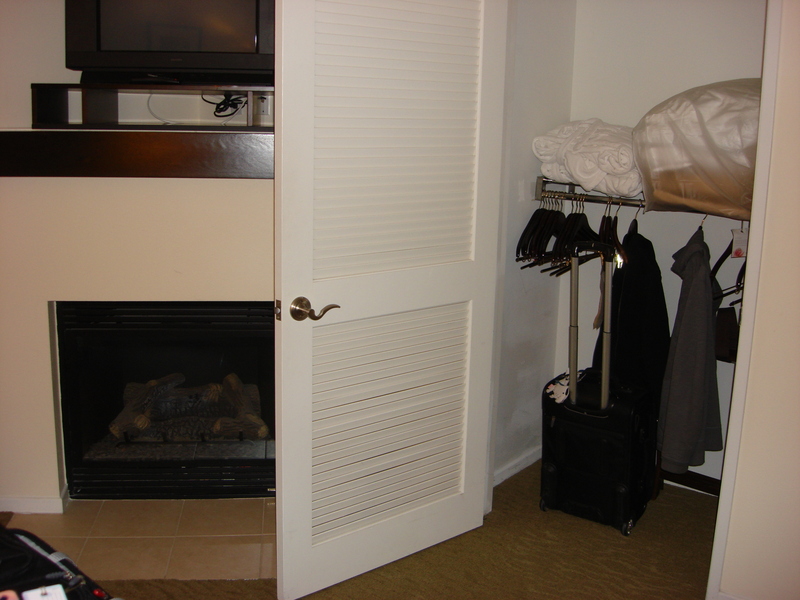 There was also a large closet next to the door that has lowered railings for ease of use. The bathroom in this unit was really something. I always love places that have both a wheel-in shower and a bathtub and this one had both and both were nice! 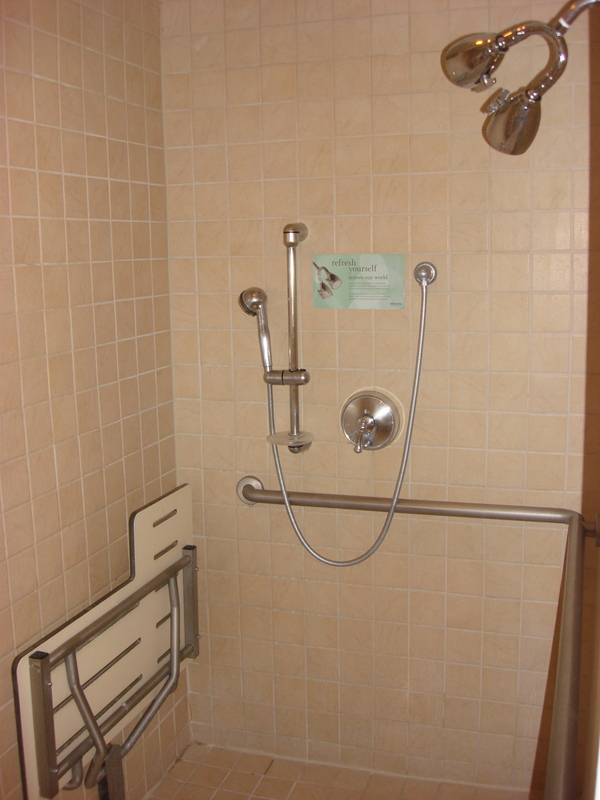 The wheel-in shower had a built-in shower bench which was close enough to the controls that a wheelchair user could use them on their own. 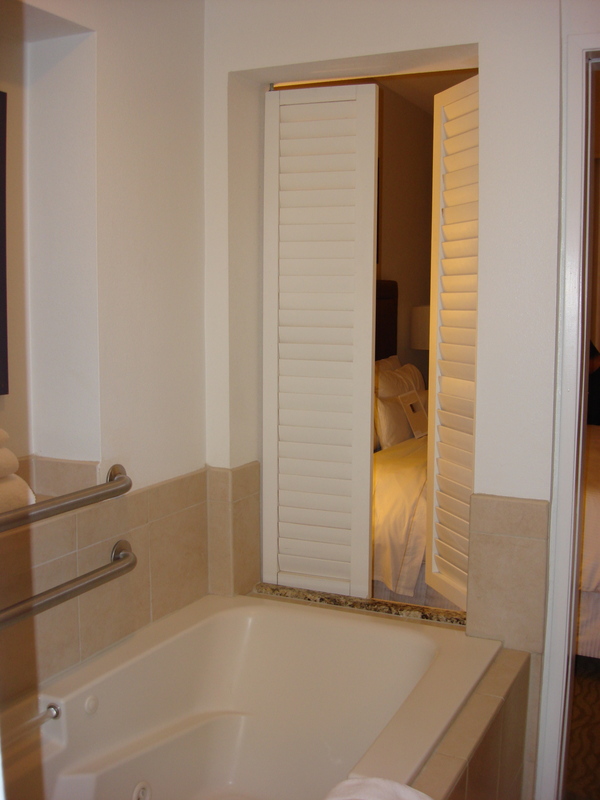 The jetted bathtub was huge and one nice feature is that you could watch TV from the bathtub if you opened up the shutters in between the bathtub and the bedroom. 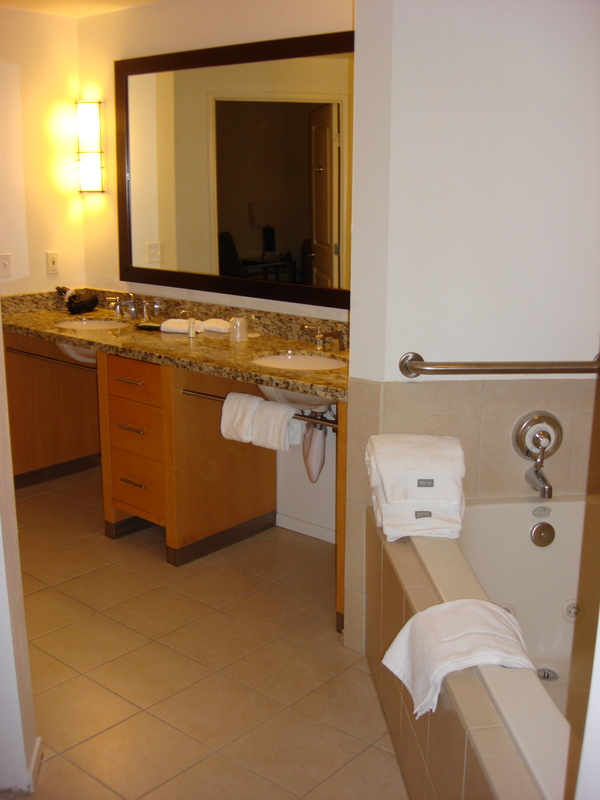 There were two wheel-under sinks in the bathroom and a toilet with two grab bars. 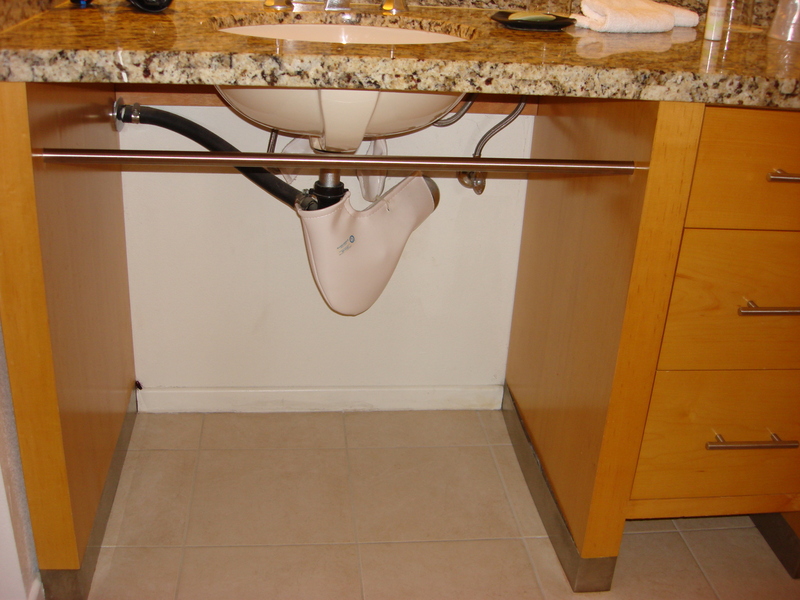 The mirror over the counter was the perfect height for wheelchair users and able-bodied users. 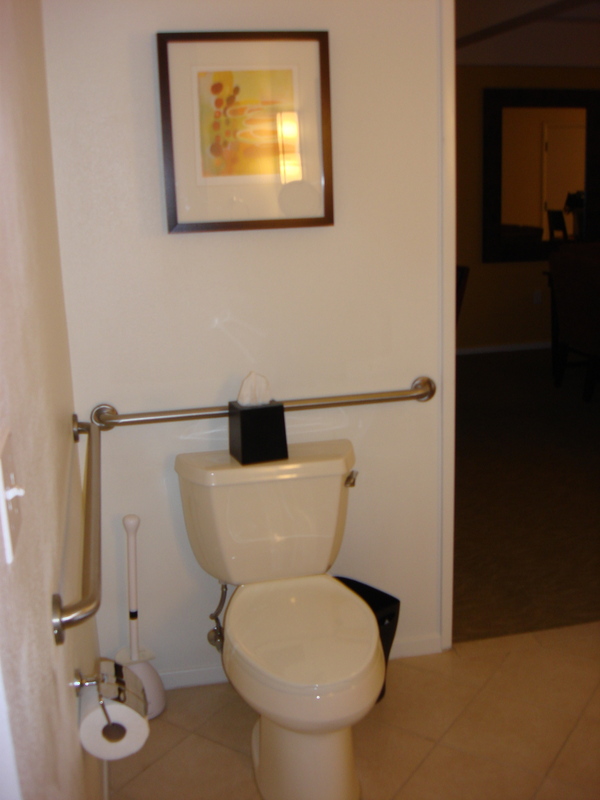 Overall this bathroom was perfectly equipped for wheelchair accessibility. 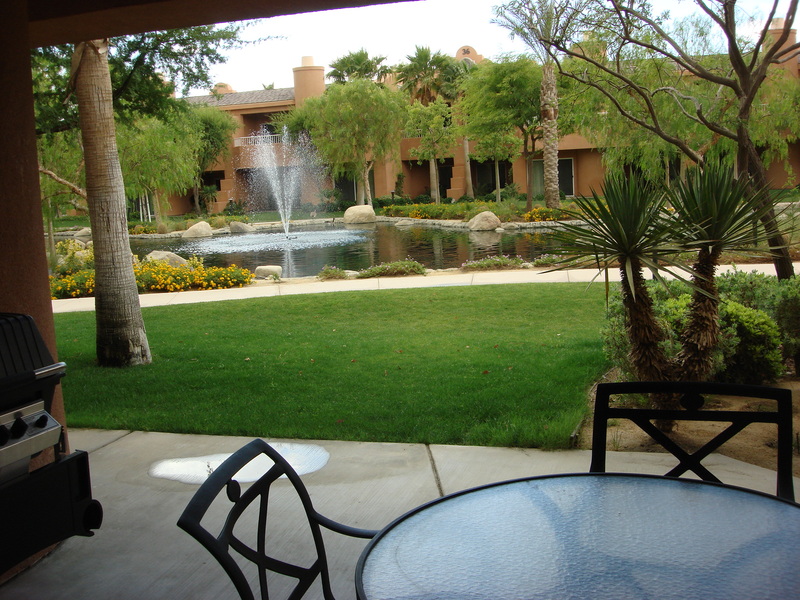 The outside grounds at this resort were really beautiful and well-maintained. Everything was green and there were fountains and little ducks everywhere. The pathways around the resort were all paved and easy to wheel on. There were a few wooden bridges that went over top of the water areas, but they were flat bridges and could be easily navigated in a wheelchair. The pool area was large and we found it easy to find a spot to sit in the shade. There was a pool lift at the pool. We didn’t make use of it, but we did see it and if you look in the back of the middle of the below picture, you might be able to see it. There was a really cool hot-tub area here too hidden inside some rocks and we made use of that even though there was no lift for the hot tub. We asked for help to get in and out and the other guests were more than happy to assist. 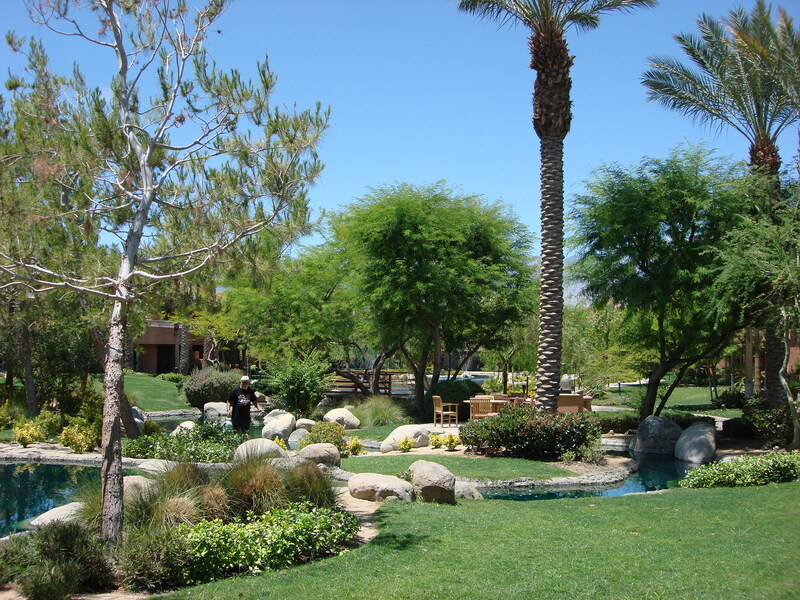 While in Palm Springs, we took in the shopping at the outlet mall (Desert Hills Premium Outlets) and in the El Paseo Shopping District. Both areas were accessible and easy to get around in. The outlet mall is absolutely massive, so do take note of where the washrooms are as there aren’t that many and they seem hard to find when you need them. El Paseo was fun to walk around in but is very expensive. We also took in the Palm Springs Street Fair or VillageFest, which takes place every Thursday night. There was a ton of food, artwork, crafts and entertainment and it was a fun atmosphere. This is definitely worth doing in order to see a lot in a short amount of time. I also have to mention that we ate at a Mexican restaurant called La Casita, which was arguably some of the best Mexican food we have ever had. The decor leaves a lot to be desired, but the food is amazing. This place is definitely worth looking up if you are in the area. 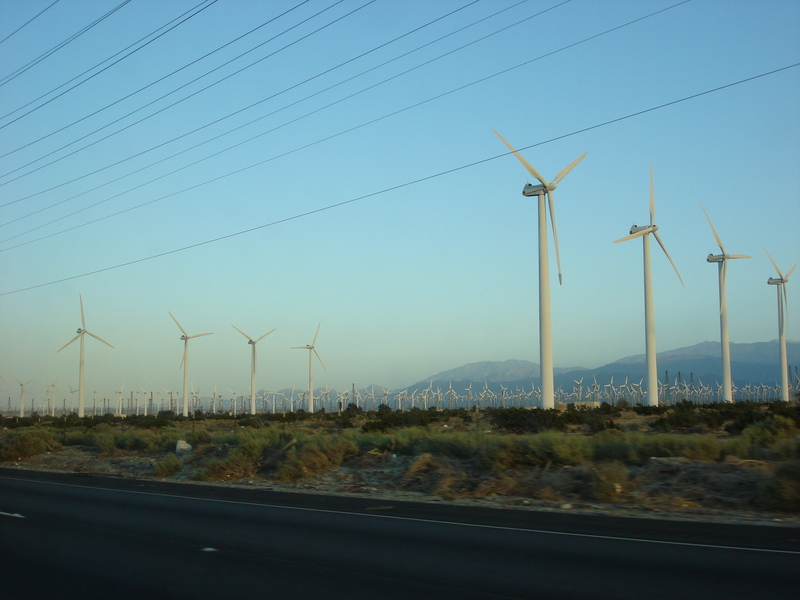 We had never been to Palm Springs before and had no idea what to expect. Now, having been there, I feel like there isn’t a lot to do there other than shopping and golf. The outlet mall is good but it is really too large to explore in one day. There are definitely some deals to be had, but trying to see it all is pretty exhausting. We don’t golf, so we failed to appreciate the beauty of the multitude of golf courses here. There aren’t a lot of restaurants or shops close by to this resort. You definitely need to have a rental car if you are staying here. There is a restaurant by the pool at the resort but it is only open select hours and the food is just so-so. 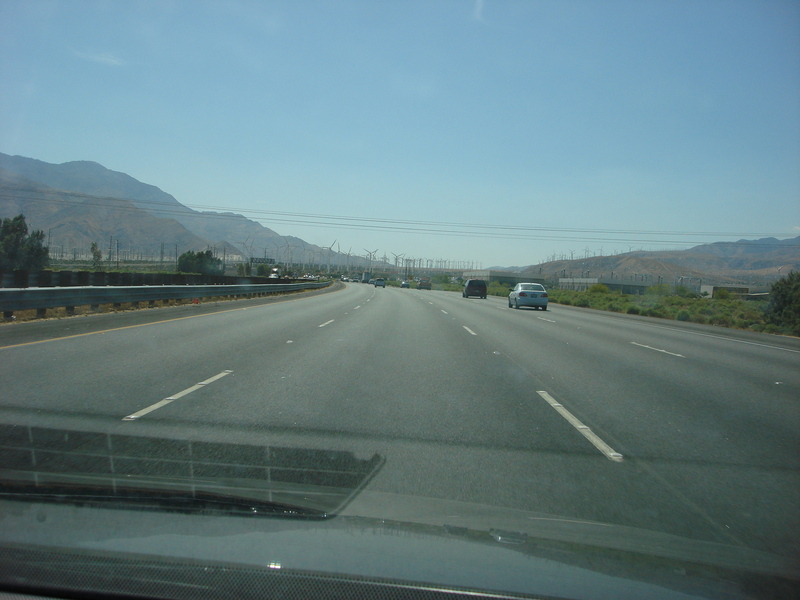 You will find lots of restaurants and grocery stores in Palm Springs, but you will need to drive there. 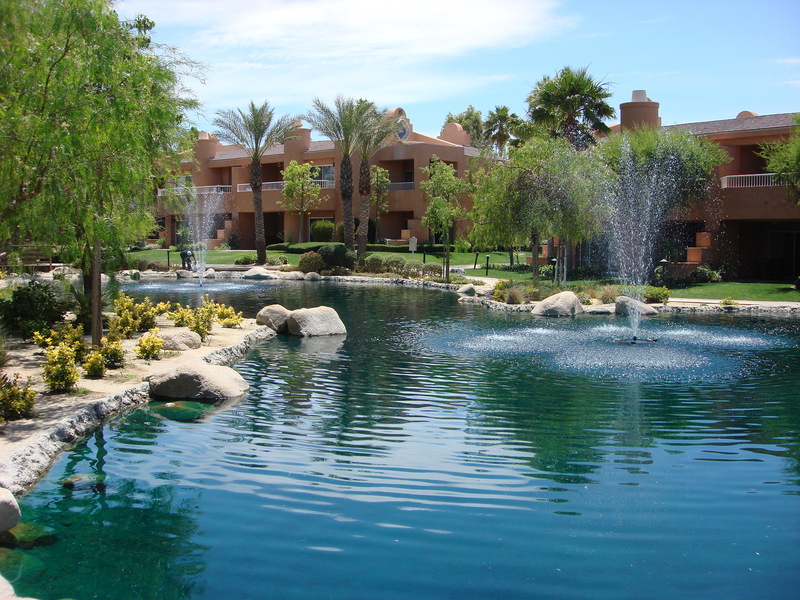 The location of this resort is very quiet, but it isn’t right in Palm Springs. 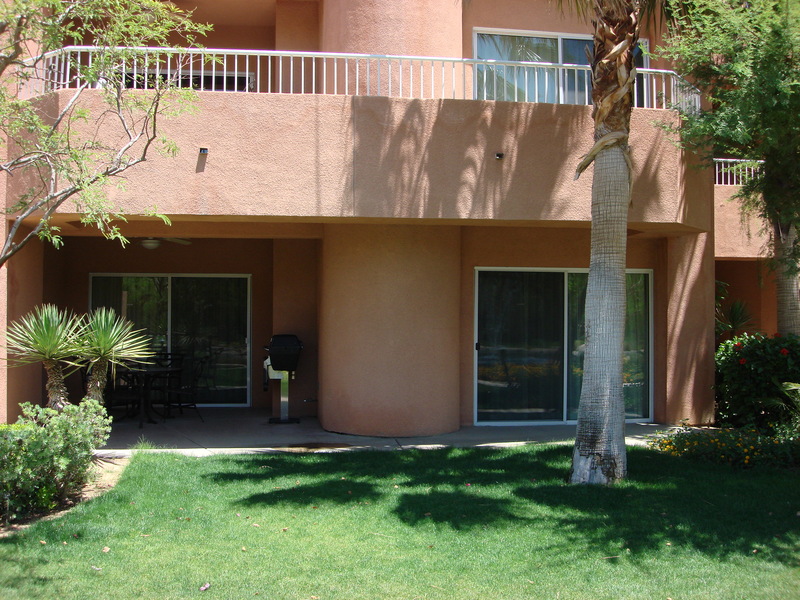 It is about a 15 minute drive from the airport and from downtown Palm Springs. It takes about 30 minutes to drive to the outlet mall, although it’s a very easy highway drive to get there. There was nothing ugly about this resort. Overall, this resort is a beautiful, wheelchair accessible place to escape to. If you enjoy shopping, golfing or gambling, there are lots of attractions here to keep you occupied. Otherwise, you can take in the scenery, relax by the pool, enjoy the hot temperatures and try some good local restaurants.